In 1980, the U.S. Congress authorized the Vietnam Veterans Memorial Fund to construct a national memorial to commemorate and honor Vietnam War servicemembers. The Vietnam Veterans Memorial was dedicated on November 13, 1982, in Washington, D.C., and is visited by more than 5.6 million people each year. Soon thereafter, it became clear that families across the country, not just those visiting Washington, D.C., greatly desired the opportunity to honor those who were lost, and to pay their respects to the approximately 7.3 million Vietnam War veterans living today. Thus, the Vietnam Veterans Memorial Fund built an iconic replica of the Vietnam Veterans Memorial, which travels across the country as part of The Wall That Heals exhibit, and has been displayed at almost 600 communities nationwide since its creation in 1996. 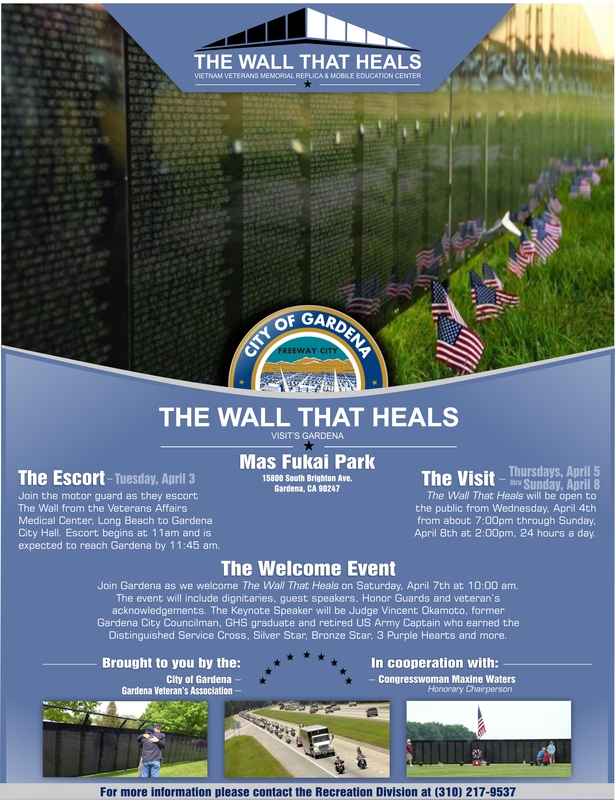 Last week, The Wall That Heals made its inaugural visit to the 43rd Congressional District in the City of Gardena. As the Honorary Chairperson of the Host Committee for The Wall That Heals, Congresswoman Waters worked with the Vietnam Veterans Memorial Fund and City of Gardena officials for nearly two years to bring the exhibit to the South Bay where hundreds of local veterans, military families, elected officials, and residents gathered to view the exhibit from Wednesday, April 4 to Sunday, April 8, 2018 at the Mas Fukai Park. “I am proud to have introduced a resolution in the 115th Congress in recognition of the Vietnam Veterans Memorial, The Wall That Heals exhibit, and Vietnam veterans for their devotion to neighbor, community, and country. I want all of the Vietnam veterans to know, even if you’ve never been told before, that this country appreciates you, we respect you, and we love you,” said Congresswoman Waters. The resolution, H. Res. 821, recognizes the importance of both memorials and the distinguished servicemembers the memorials honor and commemorate. Upon its introduction, Congresswoman Waters also delivered a speech on the House Floor to discuss the resolution and her support for veterans and military families.